It is 4:19 pmWho is looking after your packaging efficiency? Twenty-four hours a day, Jules uses an extremely precise sensor system to monitor the settings and performance indicators of your automatic or semi-automatic stretch film wrapping machine, determined to avoid waste and prevent serious damage to your merchandise. Would you do anything you could to control costs and optimize your company’s operations? You’ll probably get along very well with Jules! Save money in real time by using the right amount of stretch film (and avoiding over packaging). 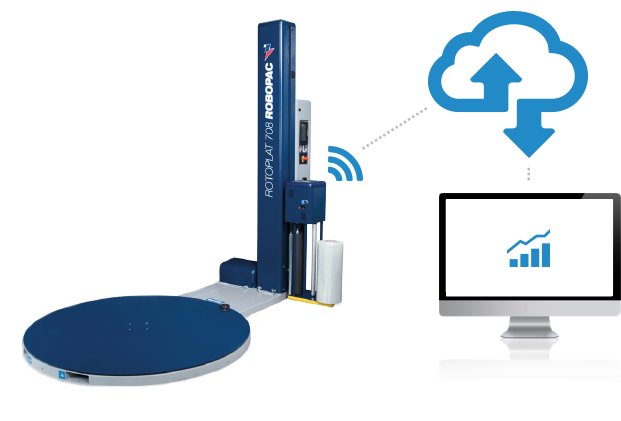 Did you know that a poorly calibrated automatic wrapping machine can quickly become a major source of waste? Continuously improve your performance by adopting best practices. Film pre-stretching, tension, consumption . . . Jules’s sensors make it possible to establish and maintain the optimal settings for your specific packaging process. Improve the reliability and protectiveness of your packaging by maintaining your optimal settings on a daily basis. With Jules, inefficiency has no place. Be warned as soon as a machine shows signs of wear or an operator changes the settings by mistake. This way, you will prevent merchandise from breaking, and at the same time protect your employees and the reputation of your brand in the eyes of consumers. Save time and increase efficiency with remote interventions. Based on precise information transmitted by Jules in real time, Cartier’s control centre can guide your team step by step in order to quickly make any necessary adjustments, thereby preventing more expensive breakdowns and avoiding travel to the site whenever possible. Adopt eco-friendly practices by reducing film consumption. Improve your sustainability record by using just the required amount of packaging. Jules’s raison d’être is to ensure the performance of your packaging equipment and to optimize your film consumption. A revelation of Industry 4.0, his sensor system is installed on automatic and semi-automatic stretch film wrapping machines and is connected to Cartier’s control centre using cloud technology. Would you like to know more about how Jules’s connectivity can contribute to your factory’s profits? Make an appointment with our Sales Director – Major Accounts, Nicolas Boulay, for a demonstration!